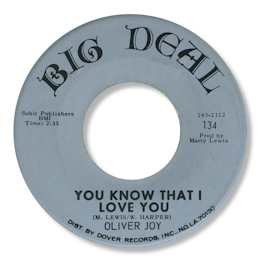 I just can’t get enough of those New Orleans 45s – and here’s another trio of real goodies from Oliver Joy. Of his 45s for Big Deal only one of the tracks is a big ticket Northern item, so of course I want to highlight the other three sides. 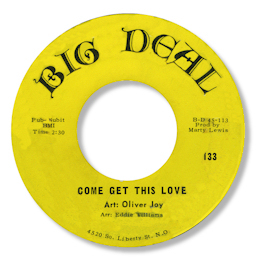 His first Come Get This Love is classic Big Easy 60s deep soul fare – a lovely plodding piano and some tasty guitar licks backed by a big big horn section. Joy comes across really well especially on the rap towards the run out – just a lovely record. The other side is the Northern dancer. Joy’s second effort is the pick of them though – he sounds so much more gritty and the inclusion of some background singers gives both sides some real backbone and weight. You Know That I Love You is right in the same bag as his initial 45 – you gotta love that out of tune piano – could it be maestro Allen Toussaint playing? Those harp-like phrases down the keys sound an awful lot like his style. Don’t Let Nobody Tell You is really excellent, maybe the best track here. Dead slow pace, hoarse vocals, tasteful arrangement – what more could any deep fan want?